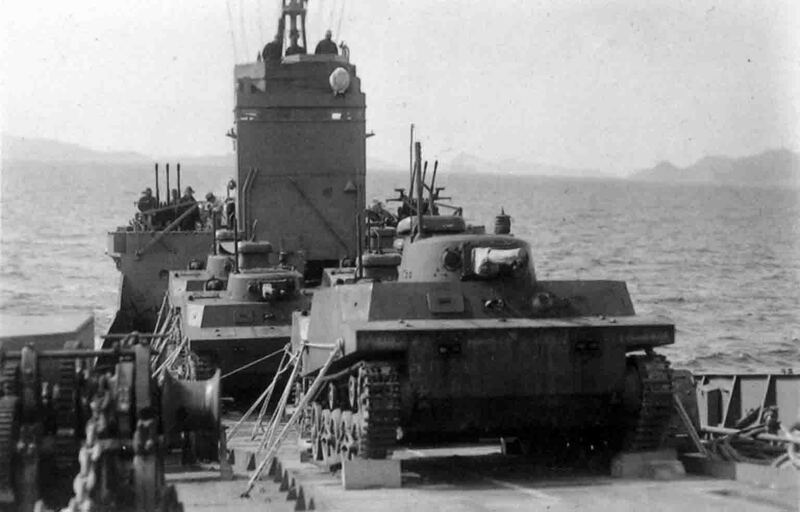 Japanese floating tanks Type 2 “Ka-mi” (101st Special Marine Assault Detachment), with pontoons removed on board the sea transport, which delivers reinforcements to Saipan Island. Japanese floating tank “Ka-mi”. Combat weight – 11 tons. Crew – 5 people. Armament – one 37-mm cannon, two machine guns. Armor: forehead body – 16 mm, side – 14 mm, turret – 14 mm. Engine – diesel, 110 horsepower. Speed ​​on land is 37 km / h, on water – 9.6 km / h. Cruising range on the highway – 170 km.